It is a great privilege to have thermal springs right on your doorstep. 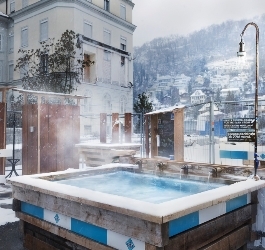 There are many different ways to experience the most mineral-rich thermal waters in Switzerland in the baths of Baden – and some of them don't even cost anything. From a free foot bath to traditional thermal baths all the way to private spa suites, the baths district has a large range of thermal spring activities. Treat yourself with a visit to the Novum Spa. 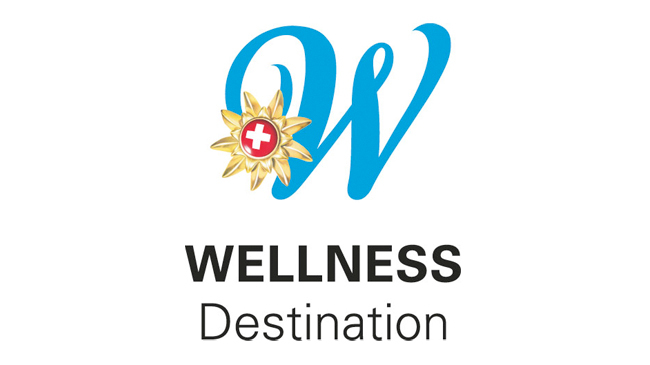 In addition to the beneficial effects of the thermal bath, there is also a steam bath, a cold room and a sauna. Immerse yourself in the world of well-being, switch off and let yourself be carried away by the perfect relaxation. Relax in the private spa suites of the Limmathof Baden and enjoy the tranquility and thermal water in a cozy togetherness. It is a pleasure to step into wide traditional bath tubes, which have a direct access to the in-house source of Switzerland's most mineral-rich water. Let your body, soul and spirit in the historic baths reconcile: You will have the full experience of the traditional baths in the Atrium-Hotel Blume. Thanks to the natural soothing warmth of the water and financial support from the Lägern-Baregg Raiffeisenbank, the Thermalbank offers year-round enjoyment. It is open for use 24/7. The beautiful "Blueme-Bädli" invites everyone to enjoy the open air thermal water pool. Food and drinks can be ordered on request directly to the bath. The "Blueme-Bädli" is daily freely accessible from 11 a.m. to 10 p.m. Attention: Only until April 7th 2019 in operation - it's summer break after. One can bathe in hot thermal water in the open air pool called "Bagno Popolare" at the Limmatpromenade (close to the Kurplatz) in Baden. Attention: Since 28.2.2019 out of service. When and where it goes on is currently being examined. Thermal water fountain Restaurant Hirsch in Ennetbaden: This thermal water fountain is located at the Restaurant Hirsch in Ennetbaden. The fountain is decorated with a mosaic created by the painter and mosaic artist Karl Otto Hügin in 1942. Hot Stone: Pentagonal, approx. 4-tonne stone slab on the Kurplatz. The "Heisser Stein" (hot stone) is warmed by the underlying "Grosser Heisser Stein" (great hot stone) spring, which can be clearly felt at this spot. Before the Kurplatz was levelled in 1824, the stone stuck out over the ground at seat height. It was formerly used to sell fruits, vegetables and baked goods. Find out more about the baths on our public or individually bookable guided city tour "From Aquae Helveticae to Botta". More information about the Thermal waters and springs. 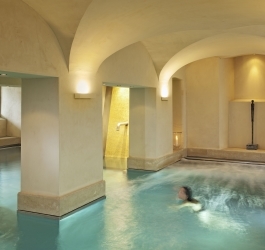 Would you like to enjoy the thermal water und to stay for a weekend in Baden? Take a break and relax.